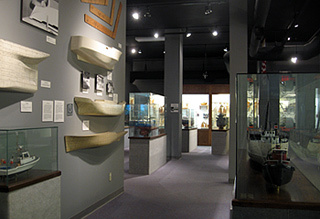 The Baumgartner Gallery houses a complete Door County lighthouse exhibit, as well as a wide-ranging collection of model ships. Door County is famous for having the third largest concentration of lighthouses in the United States. The museum’s “Sentinels of the Shore” exhibit brings together all elements of a lighthouse – from the searing beams of light they throw, to the stalwart lighthouse keepers who led a lonely 24-hour-a-day job, to the beauty and grace of the towering lighthouse itself. Browse a collection of more than 30 models. Massive ocean freighters, jumbo barges and million-dollar luxury yachts are brought down to size in the gallery’s model room.